Why was there a Pentagram clearly displayed on the front of the Branham Tabernacle? What does the Pentagram mean? Was it a symbol of freemasonry? Was it a symbol designed to ward off witches and evil spirits? Most importantly, why was the Pentagram on display and not the cross of Christ? What symbolism could be more important than the cross on a church? What does that say about William Branham and his beliefs? Also, why was the Pentagram at an angle? Was it an inverted pentagram, a symbol of Satan? Or was it the Pentagram of Venus, a clear occult symbol? Or was it simply the result of inept installation, the work of an inebriated mason? 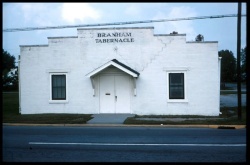 We are aware that William Branham stated that he first held meetings in the Masonic Temple in Jeffersonville but that was before the Branham Tabernacle was built and not at the same location. The pentagram (also referred to as a pentacle, pentalpha, pentangle or star pentagon) is the shape of a five-pointed star drawn with five straight strokes. The pentagram is one of the most ancient symbols in human history and dates back to Babylon. The Pentagram is believed to have originated from the star shaped pattern formed by the the planet Venus in its journey through the sky as watched by ancient astronomers. The pentagram was used in ancient times as a Christian symbol for the five senses, or of the five wounds of Christ. The five-pointed star is a symbol of the Bahá'í Faith. The Church of Jesus Christ of Latter-day Saints began using both upright and inverted five-pointed stars in Temple architecture, dating from the Nauvoo Illinois Temple dedicated on 30 April 1846. In many contemporary Wiccan traditions (witchcraft), the elements are associated with the points of the Pentagram in the following way: Spirit (top), Air (left), Water (right), Earth (bottom left), Fire (bottom right). There was a passage in the Old Testament book of Isaiah 14:12 which prophesied the overthrow of Babylon's king, stating: 'How are you fallen from heaven, day star, son of the dawn!' As is made clear by the term 'son of the dawn', the Isaiah reference was to the King of Babylon, but astronomically the 'day star' or 'morning star' is Venus, which appears in the sky before sunrise. In Latin, Venus 'the light-bringer' was referred to as the lux-fer, or as it was more commonly written, 'the lucifer'. 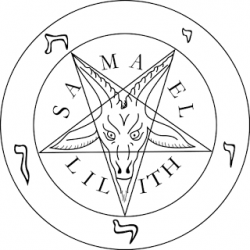 What is the Sigil of Baphomet? Is this the symbol that was originally displayed on the front of the Branham Tabernacle? In the illustration on the right, Samael is another name for Satan and Lilith is his wife, a feminine demonic creature of the night, possessing wings and long flowing hair, derived from Babylonian legends. Together they form an anti-Adam and Eve. ...oriented in the opposite direction, the pentagrammatic Star is nothing more than a symbol of iniquity, perdition, blasphemy: its two points in the air become the horns of the foul Goat threatening Heaven, and whose head is framed with the stellar pentacle, with its low ears in the side branches, and its beard in disorder in the single lower point. You Masons here and so forth and ones of you and know the order, how they cut out the stones and hauled them to Joppa and so forth. And by ox cart taking them on down, the tall cedars in Lebanon and how they cut it and so forth and brought it down. But when it was all piled together outside of Jerusalem, there wasn't a buzz of a saw or a sound of a hammer for the space of forty years. I have nothing against lodges, but Masonry, Odd Fellows, or any of them, would be just as well if it's ceremony. It has it's good and bad, just like the Church. But Christianity is a living Being in mankind, that's a proof of the resurrection of--of God's Son, Who was God with us. You know, a mason knows a mason when he speaks to him. And different lodges know by different signs. The Christian does too. There's just something about when you speak to a man, and you feel that gentle sweet spirit, you know he's your brother. There's just something about him. Now, I ain't saying nothing on Kiwanis now. That's all right. See? Just some people take... 'Cause I--I believe that the Masons are all right, but the Mason Lodge will never take the place of the Church, or the Blood of Jesus Christ. All my people are Masons, and they're all right as a lodge. But it won't take the place of the Church. And the trouble of it is, you've got the church, till it's no more than a Masonic lodge, or any other lodge. The church is a house of God where Christ lives and manifests Himself amongst the people. That's right. Now, that would knock out that astronomic year or the Julian year--calendar (See? ), the Masonic year, because the world's tilted. We all know that from study in school, and it's out of cater. Therefore they--them stars wouldn't pass in line of the earth at the same time. 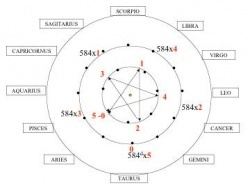 Therefore, the Roman calendar is wrong too, because you cannot put together the days... There's just many things that I could say right here. That we find out by even nature itself teaches us there's only thirty days exactly in the year. Brother Branham, is there anything wrong with belonging to a lodge after we have become a Christian, such as the Masons? No, sir. You be a Christian wherever you are. I don't care where you are, you can still be a Christian. ...they go to a foreign mission work. And his good friend and mine, Brother Skaggs, Leonard Skaggs, from Lowell, Indiana, was standing there, and I never knew before; he was a Mason. He had a Mason's button on him, and we were talking about the Masonic order. And so, the old Brother Stewart said to me; he said, "I like you, Brother Branham, and I'd like to talk to you," (excuse this expression), but he said, "you're harder to get to than a Turkish harem." Well, I don't mean to be that way; I love people. But I just imagine... I went home and I told my wife, and we set at the table and laughed, how hard it would be to get to a Turkish harem, you know. So--so I hope it isn't quite that difficult, Brother Stewart, if you're still in here. But I sure did think that was a little sense of humor that kinda made us all have a chuckle. So I wished I could see everyone. And I love everyone (That is true. ); whether they're a friend or foe, it's just the same. You Masons, I'll call your attention. You remember the sign of the cross? Now, you--you know what I'm talking about. Now, notice. Now, if you--if you notice that was packing and preserving that Bible. See? And they had to labor among one another. There you are, the ox. ↑ D. E. Aune, “Night Hag,” ed. Geoffrey W Bromiley, The International Standard Bible Encyclopedia, Revised (Wm. B. Eerdmans, 1979–1988), 536. ↑ Isidore Singer, ed., The Jewish Encyclopedia: A Descriptive Record of the History, Religion, Literature, and Customs of the Jewish People from the Earliest Times to the Present Day, 12 Volumes (New York; London: Funk & Wagnalls, 1901–1906), 38. This page was last edited on 23 August 2015, at 04:26.